To those of us who have children, we have found those moments in life when we are full of pride. I have worked hard at being respectful of my children's privacy as I speak of my life, and my lessons along the way. But this is a story that I feel is timely and I feel it is important to share it with you. My daughter Heather is now a 5th grade teacher at Matoska Elementary School in White Bear lake, and coaches the White Bear Lake Cheerleaders. Her days are surrounded by youth all day, and many times, her coaching duties takes her day into the late evening hours. She learned her strong work ethic from her dad. His words to his children were always " Just be a good person, and help others". Such simple words, but it was the best gift he could have given them. There is a little girl who is a younger sister of a cheerleader on her team. 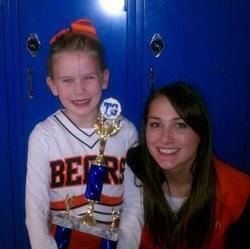 She is in love with cheerleading, and her fabulous orange and black attire is reflective of her love for all of it. She comes to every practice, competition, and youth clinic, filled with spirit and pride. She is at Heather's side most of the time, and they have formed a wonderful friendship. This is a little girl who is fighting her own health battles, and when she has gone into the hospital, her friend, coach, and mentor is at her side supporting her and giving her encouragement. The other night, Heather came over to pick up some things for her classroom holiday party. She arrived and showed me all the wonderful gifts she received from her cheerleaders that night. Cards and gifts to a coach that is indeed well loved. I felt her father in our presence at that moment. As I was admiring it all, she stopped and said, "Oh, hang on, I have to go out in the car and get something to show you, you are going to love it!." It was a gift card to her favorite restaurant, and a beautiful handwritten card wishing her a Merry Christmas from her little friend, It was painstakingly printed in cursive, thanking her for letting her be a part of the team; the "big girls". The gift card was so generous, and she looked at the little girl's father and said. "This is too much" The father said "Oh no, this is all her idea, and she wants you to have it" It was such a gift from the heart. Heather said that she was going to keep the card, possibly frame it, and give it to her on her graduation. Mentoring children..What does it all mean? For Heather, it meant letting a little girl be a part of the "big girls", and allowing her to find a place right next to her as she coached them. It meant making a warm and cozy visit to a hospital room, with words of encouragement. to a scared and sick little girl who needed the adults in her life that she trusted. When she needed her very own cheerleader. My daughter's visit with me was brief that evening, and she was off to get the holiday lesson ready for the next day. But it recharged my heart, and I felt such a profound blessings at that moment. She was giving back to the world, and paying all of it forward...to honor her father. I felt his nod..and his smile. Mentoring children..During a week, when we all suffered the loss of 20 beautiful little children, we learned the lesson of how precious the world's children are. We can't teach them to pay it all forward if they don't understand what that means. The next time you see a child, remember that it takes a village. Even if all you have to offer them is a kind smile, then smile! And if you are lucky, someday you will get to witness them paying it forward to others...Perhaps one of the most profound blessings you will every receive..